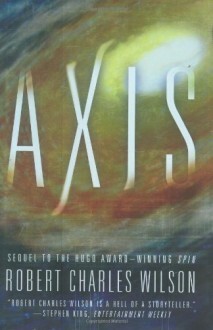 Wildly praised by readers and critics alike, Robert Charles Wilson's Spin won science fiction's highest honor, the Hugo Award for Best Novel. Now, in Spin's direct sequel, Wilson takes us to the "world next door"--the planet engineered by the mysterious Hypotheticals to support human life, and connected to Earth by way of the Arch that towers hundreds of miles over the Indian Ocean. Humans are colonizing this new world--and, predictably, fiercely exploiting its resources, chiefly large deposits of oil in the western deserts of the continent of Equatoria. Lise Adams is a young woman attempting to uncover the mystery of her father's disappearance ten years earlier. Turk Findley is an ex-sailor and sometimes-drifter. They come together when an infall of cometary dust seeds the planet with tiny remnant Hypothetical machines. Soon, this seemingly hospitable world will become very alien indeed--as the nature of time is once again twisted, by entities unknown. Not quite as amazing as the first as most of the concepts that made the first book so great are continued here. It is more of a story set in a science fiction universe than a sci-fi book, and that's a good thing. It continues the arc of the first book and answers more questions than it raises. It was a nice continuation of the Spin story-line, but not much of a novel. I'm glad I read it because it is a well written story and had a few interesting ideas. An all-around better book than its prequel Spin. The pace is better, the characters more interesting, and there's almost no current-level technology to get wrong (though the inability to track cell phones was hard to swallow).